There’s no doubt that our furry or feathered friends enrich our lives, and it would be difficult for most of us to imagine our lives without their presence. 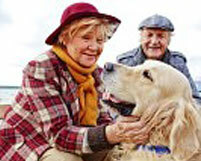 But in addition to companionship, pets may bring important health benefits to their owners. So while you take pride in providing a good home for your deserving animals, take a minute to learn about what they give back in return. Move over dogs. After the latest news from the scientific community, cats may be man’s better friend. Although often saddled with the blame for allergies and asthma in children, new studies say cats may do just the opposite. Danish scientists recently released results of a study of 400 toddlers that showed that growing up with a cat in the household were much less likely to suffer from asthma. It’s believed that a particular genetic variation plays a significant role in triggering an asthma attack. For some reason, that variant is switched off when a cat is present, resulting in fewer asthma episodes and a lower risk of pneumonia and bronchiolitis. Dogs don’t seem to have the same blocking effect on the asthma gene. However, both cats and dogs can help boost immunity in young children by exposing them to bacteria and viruses from outside the household. Pets do your heart good. Literally. The Centers for Disease Control and Prevention (CDC) and the National Institute of Health (NIH) have both done studies that show that people with dogs and cats at home have decreased blood pressure, cholesterol and triglycerides, which lowers your risk for heart disease. For those who have already experienced a heart attack, pets tend to help them recover better. It is thought that the calming effects of petting or sitting with an animal reduces stress, leading to better heart health. In one study reported in Time Health, a group of stressed adults were asked to pet a rabbit, turtle or toy. Those that touched the living creatures, whether furry or shelled, reported decreased anxiety. Ever wonder why so many dentist offices have aquariums? Fish tend to focus our attention and calm our mind and body. Your workout partner. Dogs are one up in this category. You rarely see a person jogging with their kitty (not to say you couldn’t), but dogs motivate us to get up off the couch. They provide incentive (and sometimes coercion) for us to grab a frisbee or leash and get outside. They remind us to take a break from our computers or chores and give us and our pups some exercise. Dogs do a body good. Calling Dr. Freud. Many of the benefits of pet ownership are mental or emotional. You have a friend who loves you unconditionally, listens to your rantings and lets you know you’re important to them. Pet owners tend to be happier and more social. Studies have shown children who have experienced traumatic events heal quicker when they have the opportunity to interact with animals – horses, cats, dogs, guinea pigs. Doctors at Walter Reed Army Medical Center are using dogs to help soldiers deal with PTSD. They’ve discovered that returning soldiers who have a pet that they are responsible for are able to cope better and re-enter society quicker. There is also a decrease in suicide rates among veterans with pets. Part of your medical team? You have doctors, nurses, specialists, lab personnel that work as a team to provide healthcare for you and your family. Soon, dogs may be a part of that team. Their amazing sense of smell is proving helpful to medical doctors and their patients. Some dogs have the ability to sense when a person is about to have an epileptic seizure. They are then able to prepare and protect themselves. Some dogs can detect abnormal blood sugar levels in diabetics and alert their owners to adjust their insulin. Still other dogs have the ability to detect certain types of cancer cells in humans, before they can be detected by other means. As a pet owner, you know first-hand how animals enhance our lives. But it’s good to know that their presence in our lives means more than simple companionship. They make us healthier, in mind, body and spirit.